It was late on a Wednesday evening and the woman’s voice on the other end of the phone sounded forlorn. She was anxious with questions and despairing when I was unable to provide the answers she was hoping to hear. Over the previous few days, my colleagues and I had become accustomed to these calls. The effects of the Trump Administration’s “zero tolerance” policy had hit every major news outlet. We all had witnessed young children being pulled from their mother’s hands and the desperate voices pleading officers to call a phone number that they had previously memorized and practiced. I gave her the contact information for a few partner organizations near the border. “We do have an Unaccompanied Refugee Minor Program,” I told her. “But the children at the border have families and the first priority is to reunify them with loved ones. At this time, we are not receiving any cases from the border,” I told her. After a dozen of these calls, it was obvious that our community members were feeling helpless. They needed an outlet, and these children needed to know that they were cared for and loved by so many in our country. Our staff brainstormed and researched and found that it was impossible to physically reach these children or parents waiting in detentions and processing centers. Nothing would be allowed in, no greeting cards, no games, no blankets or comfort of any kind. But there is one thing that cannot be censored or stopped: our prayers. 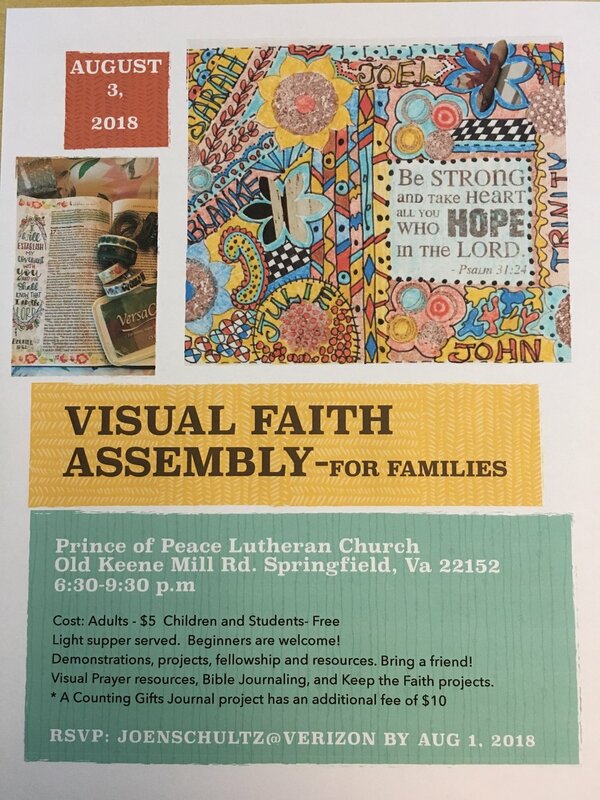 LSS/NCA is participating in the Visual Faith Workshop on August 3 in Springfield, Virginia. Our staff will be hosting a table where participants can learn more about refugee resettlement efforts and foster care for refugee children as we pray and meditate on Bible verses that remind us the value of demonstrating love to our neighbors and welcoming the stranger. During the event, prayer cards will be available for children and adults to color and send messages to the families on our Southern border. Although we are unable to physically send the cards to holding centers, we can still spread our prayers and compassion through your help. Download a free prayer card: Do your kids need a summer craft project? Prayer cards are a great way to teach them about current events through the power of compassion and kindness. Ask them to color a prayer card for a refugee or immigrant welcoming them to our communities. Display your prayer cards: Ask your congregation or faith leader permission to hang your cards in a Sunday school classroom, a display board, or meeting place. There may be someone in your own church community that would benefit from your message of welcome. 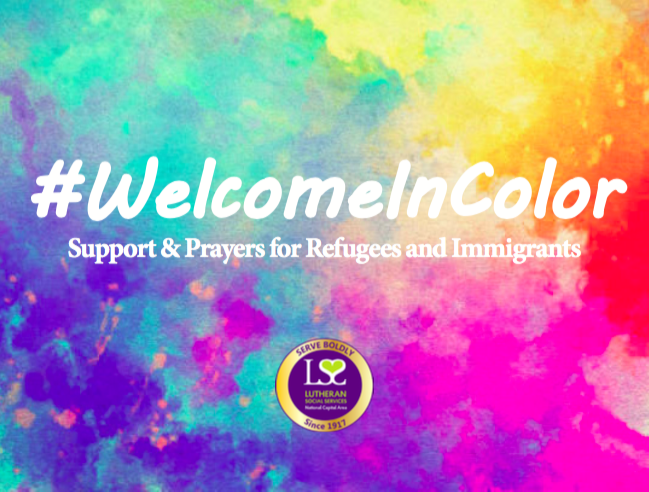 Share on social media: Tweet, post or pin using #WelcomeInColor. Share your prayer cards or Bible journaling margins, and encourage others to lift up their voices for those in need of friendship. 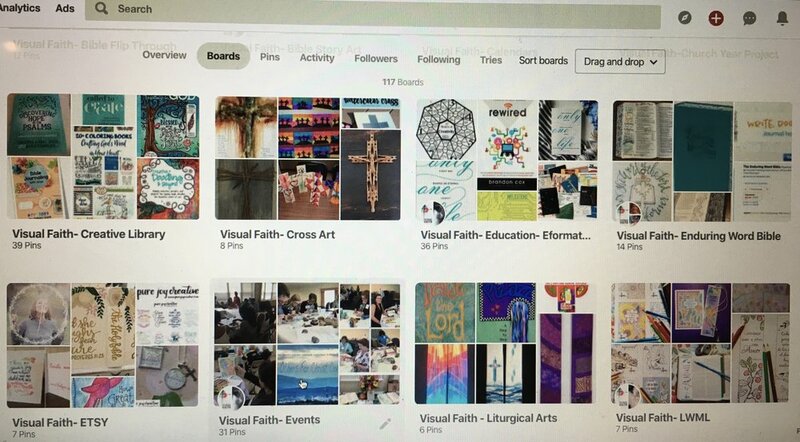 By using #WelcomeInColor, LSS/NCA and Visual Faith boards will be able to share and repost your image. Together, we can ignite compassion and welcome those who seeking refuge. A simple way to bring focus to a Bible verse. Using painter's tape - tape card to table top- placing tape to have a margin on the top, sides and a larger margin on the bottom. Using Watercolor Cards (Michael's or Hobby Lobby) simply add watercolor. Then with a Sharpie pen add silhouette images to the card. You may use a regular or fine-point Sharpie pen. Image ideas can be found by Googling Silhouettes. Remove tape and add Bible verse in the bottom space. Polaroid Praise is ready to display or bless someone else! Spending some time in the Enduring Word Bible and trying out different resources and supplies. Trying out colored pencils, napkins and Gesso, and some watercolor. Peg Peters came to a Workshop near her home in Indiana in the Fall of 2016. 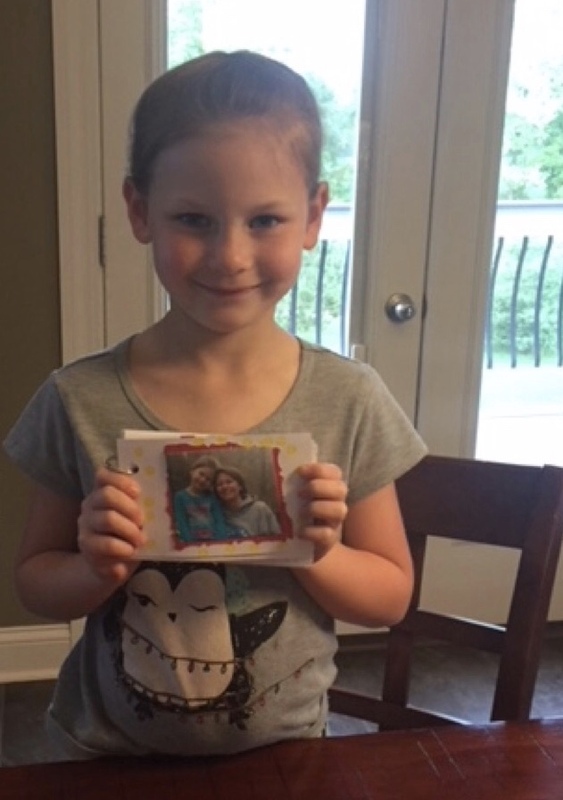 She went back very excited to share what she had learned about Visual prayer, Bible Journaling and all sorts of hands on projects for Faith Keeping. She had been watching things online for awhile and learning and trying out new practices. She couldn't wait to bring them to her church community. But, the doors didn't open quickly for that sharing. Sometimes it is about patient waiting. This event was part of our Mother-Daughter salad supper that we have every year on the Monday after Mother's Day. We call it the Ladies Salad Supper now since not everyone has a daughter.The ladies of our church were invited to attend and bring as many guests as they wanted to.We often have 3 generations. This year we even had 4 generations in one family. We presented each lady with a ziplock bag that contained a glue stick, the 31 prayer verses roughly cut up and the 35 page booklet already hooked together with the 2 rings. The pages were made by a small print company(the owner goes to our church) The ladies got a good start on their books that evening and I encouraged them to take home any embellishments, etc. that they needed to complete their prayer books. (Probably working on their own at the church for about an hour)Jodi, my daughter who is the Women's Ministry leader at Southeast Christian Church in Jeffersonville IN, presented the introductory part of the program. She is also an elementary teacher so she was able to share some insight as to how people learn in different ways. Using the items we were that night was one example of learning. We announced at church and in the bulletin for ladies that had scrapbooking materials that were not being used to bring them along. I also had a huge pile of stickers, papers, all sorts of embellishments that people were free to use in their books. It was a little like the fish and the loaves of bread. When it was over I gathered up more than I had brought it felt like! We give thanks for Peg's faithfulness to find the just right event at the just right time.We pray there will be anymore gatherings. So may you be filled with patience- all coaches and encouragers as you seek to bring Visual Faith practices to others. Our Lord has the plan.Just be ready to share with humbleness when He says- NOW! Thank you Peg for your gently persistence and listening heart. Peg Peters-(center ) and daughter Jodi and her daughter-Maggie. Creative Memories opened the door for Belinda Bost to learn the importance of documenting the story of our lives. The importance of writing about the Who, What, When, Where and Why in our own handwriting prepared her for processing with Visual Faith. It can be as simple as layering an image over the text in your Bible. A computer can enlarge or decrease an image to fit the page. Tracing paper allows the image to be added. 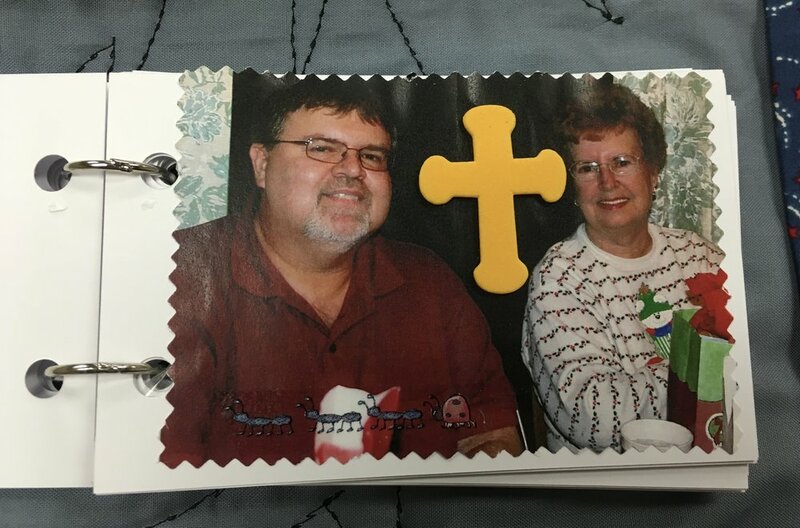 Here is an altered Dollar Tree Word Search Book that became a Lenten Word Book using the church worship folder and basic art supplies. Belinda seeks spaces in her Concordia Study Bible to add full page entries. The space between the Old and New Testament became a visual reminder of what the weeks to come would bring at the start of Lent. She used watercolor, printed paper, clip art, washi tape, embellishments and stamps. 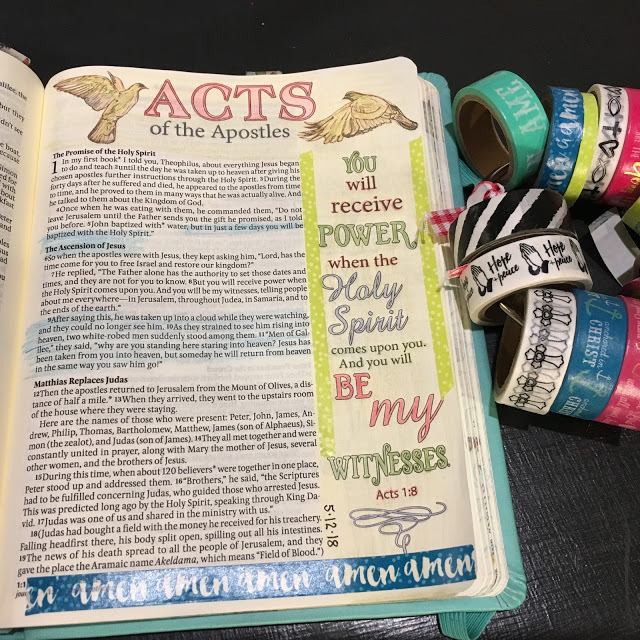 Check out Belinda's online Bible Study called- "Bloom, Praying the Stitches" which will combine the concept of Praying in Color, Scrapbooking and Collage Faith Art. There will be a fabric book cover that will be constructed during the discussion time and reflection. No sewing machine needed. You can follow the Bible study and watch the weekly video on the Do You F.R.O.G blog-- blog-www.beebeeost.blogspot.com and on the Visual Faith Ministry Facebook page. 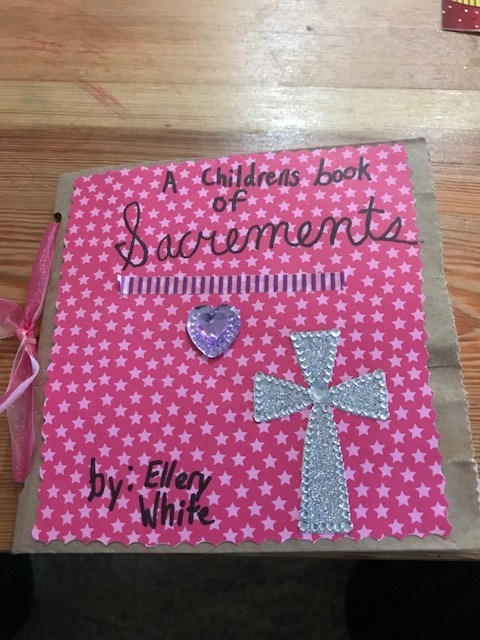 I had some time with my granddaughter- Ellery Jane White (almost 8 years old) about three weeks ago and introduced her to Bible Journaling. She absolutely loved it. My friend Bev shared with me how to make the booklets out of paper bags. Well, Ellery just decided she was going to write her own story. She had taken her first communion in the PCA Church they attend the week before. Well, she sat down and wrote her thoughts. I was a proud Grammy for sure. It was wonderful to discuss the Sacrament of Holy Communion with her. Thanks be to God. I had such a blessed time with her. Thanks to Visual Faith Coach Jean White with this simple reminder that telling the story of significant faith milestones is both legacy and a blessing to the next generation. It also enhances the story we tell of God's faithfulness to THIS generation. We are very excited about the new Enduring Word Bible coming out the first week of June from Concordia Publishing House. It is an ESV version Bible and there are 350 margins for coloring as well as the title page for each book of the Bible. That leaves many pages for your own additions, notes, journaling and images. Pat Maier is a pastor’s wife and former Lutheran educator who lives with her husband in Brighton, Michigan. Pat enjoys writing, drawing, and imagining to inspire others in their walk with Jesus. 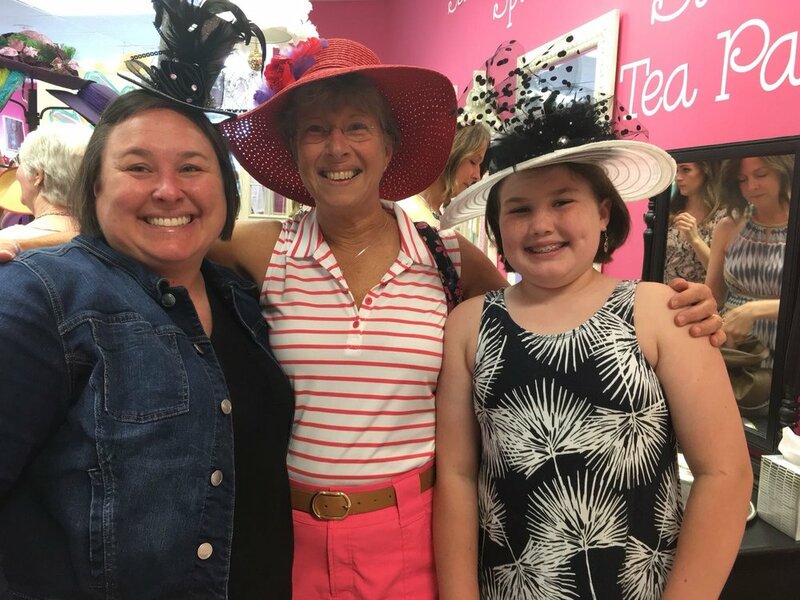 She is currently involved in planning and presenting at retreats and women’s events in the Michigan District, as well as teaching about visual faith. She finds great joy in nature, gardening, and spending time with family. 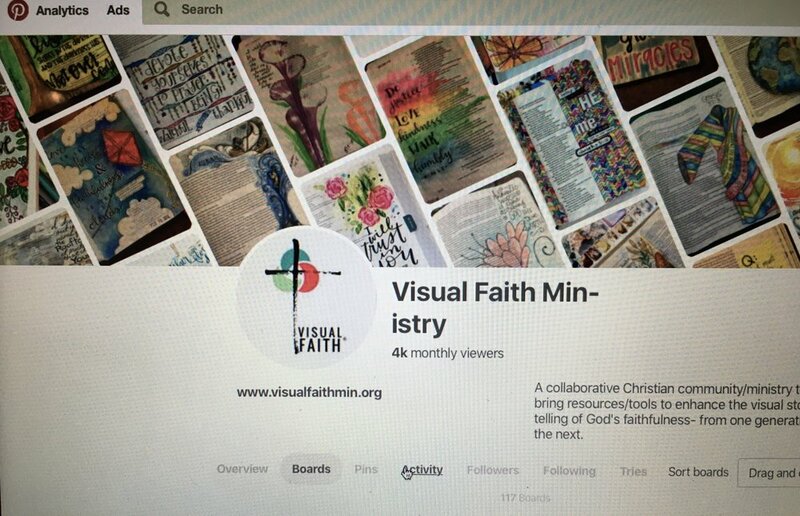 Watch for updates as we begin to explore this new Visual Faith Bible. As a Bible journaling teacher, one would assume I am swimming with Bible journaling ideas. You would think that you could give me a verse and I would come up with all sorts of brilliant DIY entries. While I have a few good standbys in my back pocket, I am often stumped by what to journal, and especially when I am trying to Bible journal with my kids. Hi: my name is Amanda, and I'm a recovering perfectist. My kids, on the other hand, are messy and have their own ideas about what to journal. Not surprisingly, when you try to put rigid Amanda into a loosey goosey kid mold, it doesn't go over well. 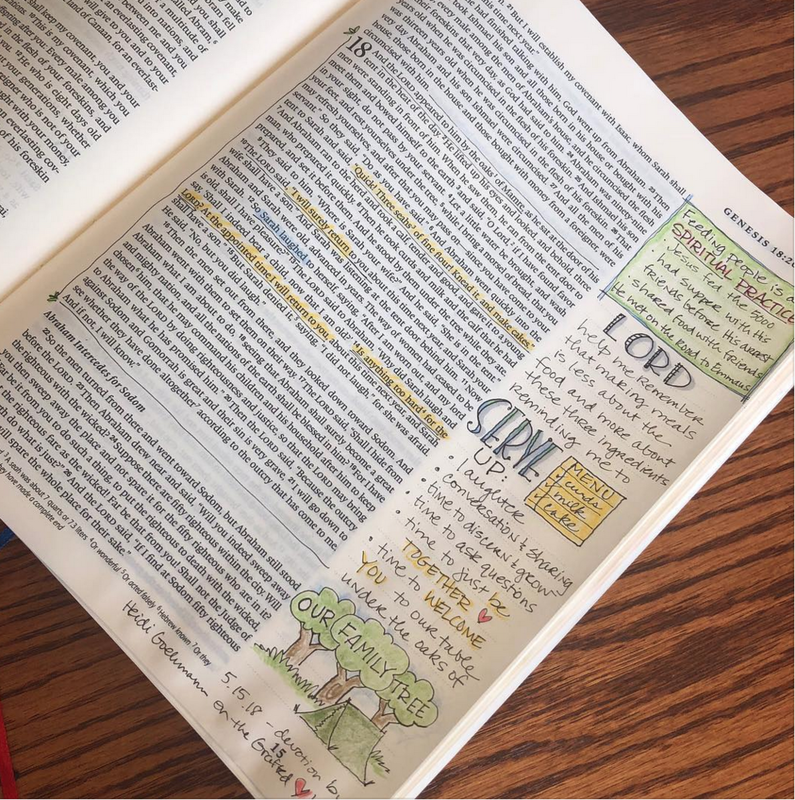 Even though it's a stretch for me, as a homeschool mom who loves to Bible journal, I desperately wanted to involve my kiddos in Bible journaling as part of our school curriculum. I wanted to have deep spiritual conversations about Jesus and how we can apply the Word to our lives but I couldn't figure out how to do it. That was, until I discovered "Bible Journaling with Kids" by Chelsea Wojcik. You know those answers to prayers you never prayed: this book was totally one of them. In this book, Chelsea gives you the basics of what you need to journal with your kids, PLUS 7 focused topical units with Bible journaling prompts for an entire year (examples: love, joy, hope, etc...). Once I got my hands on this book, I was so excited because the ideas wouldn't stop coming after that. At my finger tips, I had all the verses I needed and easy questions to ask my 5 year old. It gave me the freedom I needed to let go and be okay with my son doing his own artistic thing. The biggest factor that changed things for me was Chelsea's suggestion of getting your kid their own journaling Bible. I felt like smacking my head against a wall. OF COURSE! Why did I think of that?! So, as per Chelsea's suggestion, I immediately went to the thrift store and found a children's Bible for my 5 year old and got ready to Bible journal the first verse in the unit about love. And you know what my 5 year old said, "Mommy, this Bible doesn't look like your journaling Bible." I sighed as the joy of my clever thriftiness vanished. I tried to show him the space he could use to journal but he was a little hurt by that. After all, I send journaling Bibles to women all over the U.S., why couldn't I give him one? After thinking about it for like, half a second, I let him pick out one. Of course, it was the same cover as my main journaling Bible. My 5 year old is such a sweetie. Anyway, we ended up having a wonderful conversation about love and who to love and how we could do it that day and what makes him feel most loved. It was the glorious time in the Word I had been wanting to have with my son that, before, had felt unattainable. I started thinking about this whole predicament I had been in and how well Chelsea's book, "Bible Journaling with Kids" helped me overcome it and I thought, "If I have struggled with Bible journaling alongside my kiddos and I'm a Bible journaling teacher, how many other moms are struggling with it!?" And that is why I am sharing this book with you because, mom-to-mom, sometimes we just need a little help in order to be able to enjoy our children. Our to-do lists are long and it is easy to get overwhelmed by #allthethings we must do to keep them alive, let alone invest in them spiritually. Then there are times when I don't want to come up with yet another crafting idea to keep his mind occupied. Or I simply have no idea how to engage a 5 year old in a spiritual conversation and I just need someone to say "Do this", and Chelsea has detailed that in her book. I am so thankful that the Lord had our paths cross through the magic of Instagram because Chelsea has been such an encouragement to me through her book. If you find yourself in the "How do I Bible journal with my kids?" boat as well, there's nothing I can recommend more highly than Chelsea's new book, "Bible Journaling with Kids." Get it! You'll be so thankful you did.